Well, as a Purex Insider I have yet another opportunity to introduce you all to a new product that Purex is bringing out and this one is very nice. Purex UltraPacks are convenient, small (yet powerful) packets of liquid laundry detergent. Using these packets is super easy as all you do is toss them in the washer and watch them dissolve. This process releases the detergent and there you have it...no mess, no fuss. Although it looks like a small amount of detergent, it is very powerful and will do the job that your normal detergent would have done. I was a bit skeptical, but quickly put that aside when I saw how they worked. So, for this review I was sent a full-sized package of Purex UltraPacks Liquid Laundry Detergent. The scent I chose was the Mountain Breeze as I prefer a nicely scented detergent for my laundry. Before you handle the small packets of detergent, make sure your hands are clean and dry; otherwise you will start the dissolving process of the packet before it hits the washer. As you can see above, all the packets are the same size and are VERY pretty...so be sure to keep them out of your children's reach!!! ...and here it is all dissolved. You can see it starting to ooze out of the casing it was in. The next step once the packet has dissolved is to toss in your laundry. That is IT! No messy cup to rinse, no drips and best of all, no waste! I am pleased to tell you all that my laundry turned out looking and smelling great. I was thankful that I didn't have to make a mess and the process went quickly because of the ease of using the packets. The Mountain Breeze scent is wonderful...my favorite! 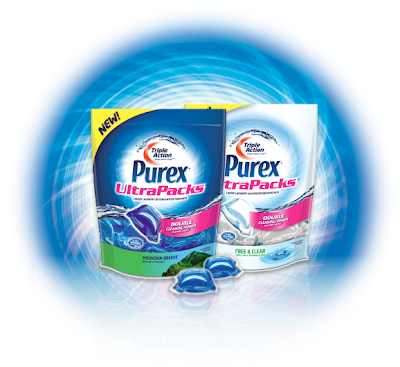 Purex UltraPacks are set to hit the stores in February of 2012 so be on the lookout for them in your area. Since I have tried the Purex brand, I have yet to return to my previous brand...that is how much I like it!! So, in my opinion...the Purex UltraPacks are a wonderful product! As a mom, I look for convenience and simplicity and this particular product has all that and more! My laundry looks and smells great and best of all, I make no messes in the process! Double thumbs up!! I would highly recommend this product to anyone out there that is looking to revolutionize their laundry time and make things easier...hey moms...sounds like you! Take advantage of the offer and check out this product today!! Disclaimer: I received no monetary compensation for this post. As a Purex Insider, I received a free, full-sized package of Purex UltraPacks for review purposes. All quotes are from the Purex website and email. All thoughts and opinions are 100% mine.